Ford just released its monthly auto sales numbers for August, and the results came in better than expected at +4.1% versus expectations for a decline of 0.8%. As we do each month, our focus in this report is truck sales, and more specifically, F-series pickup trucks. Trucks are often purchased by small businesses and contractors, so they provide a good read on the health of the small business sector, and similar to the prevailing narrative, Ford’s numbers continue to suggest a solid US economy. 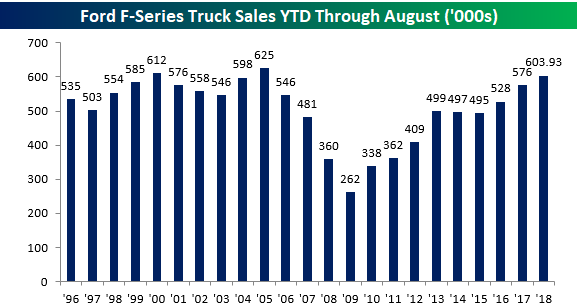 For the month of August alone, total sales of F-Series trucks totaled 81,839, which is up over 6% compared to the same month last year and is the highest monthly sales total for August since 2005 and the third best August going all the way back to 1996. With the strong August results, total YTD sales of Ford F-Series trucks now stands at 603,926. Since 1996, the only two years that saw a stronger YTD total through August were 2005 (625K) and 2000 (612K). 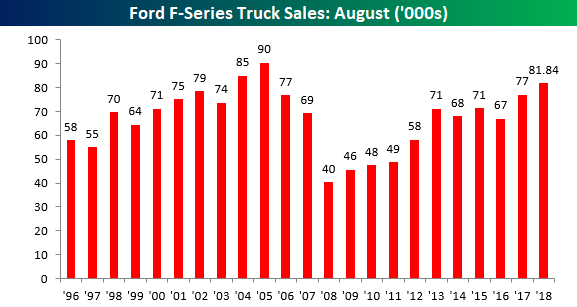 Ford’s stock may not be doing much, but the company’s trucks are selling like hotcakes!